You say your road-trip games have gotten a bit stale? Need a convenient way to hustle gas money on the go? Afraid of losing your touch while on vacation? 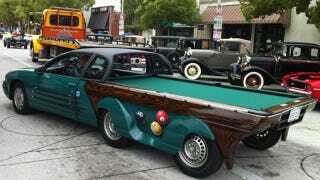 The answer, according to California's Triangle Billiards, is the Pool Table Car. The Pool Table Car started off as a beater late-Nineties Chevrolet Monte Carlo. Even after the radical surgery the car will still allegedly do 100 MPH and features a removable roof and such modern custom-car necessities as a TV and a refrigerator. Oh, but the fun really starts when the rear half of the car is unhooked from the cab and the cues are selected from the door-mounted racks. After the built-in leveling system does its job, you are presented with a full regulation Brunswick pool table. The admittedly clean conversion was done by Vini Bergeman of Discovery TV's Kustomizer series and received its public premiere at the George Barris Kustom Car Show last May. Sponsorship opportunities are still available. The Pool Car can be rented for Orange County-area events. Jokes about bumper pool are not advised.